Hi Dolls! 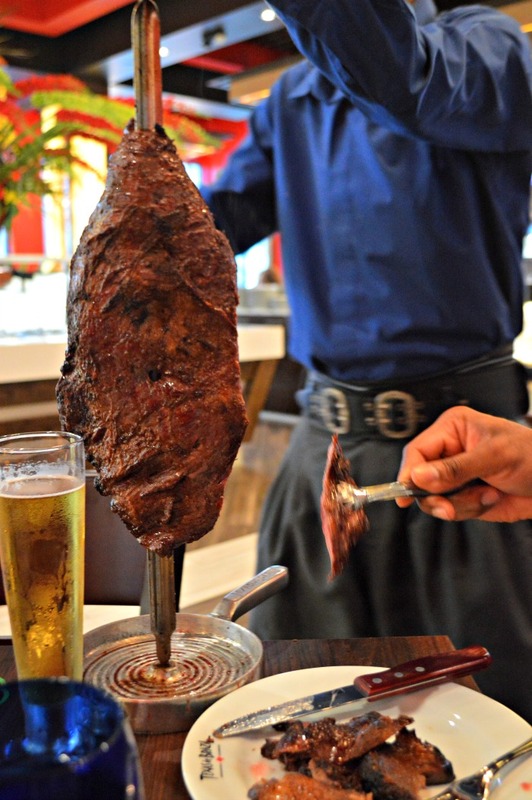 I remember being blown away by the Rodizio-style dining concept the very first time I ate at a Brazilian Steakhouse in my early 20’s. I kept thinking, “Seriously? You’re going to keep bringing me different cuts of meat until I say no more? 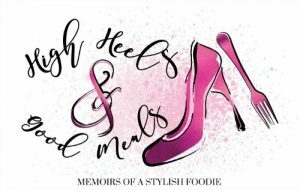 No, like for real, this is a thing?” I didn’t properly prepare for the feast that ensued because by the time I left, I was literally in pain from overeating! 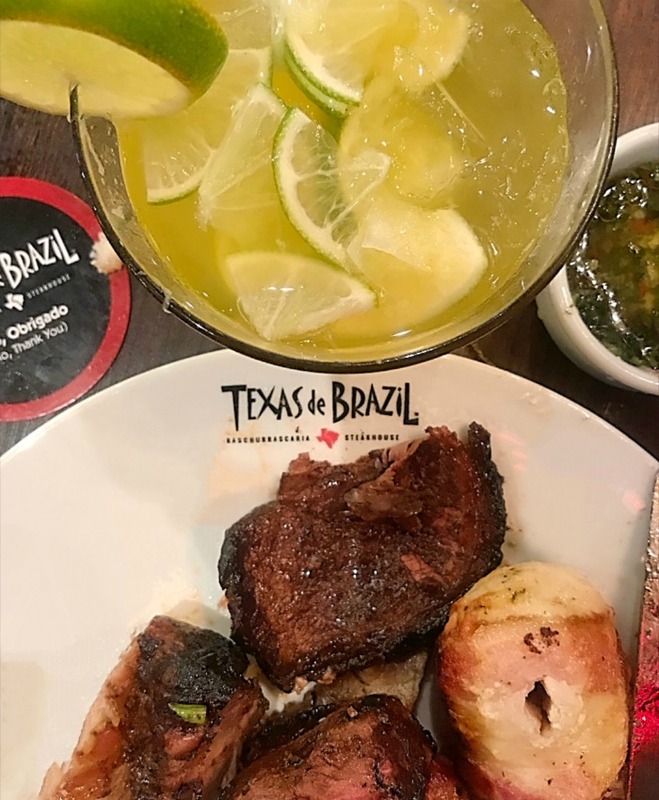 Since then, I’ve been to a few other Churrascarias in town but the newest to open is Texas de Brazil and it may very well be my favorite to date. Maybe because I’m partial to it originating from my home state of Texas, maybe because the food and service was phenomenal, or maybe it’s because all of the above! So let’s start with the decor! I absolutely love the red walls! With the beautiful mirrors, gold accents, and the incredible flower arrangement in the center of the restaurant, the decor makes for a very pleasant dining experience, aesthetically. 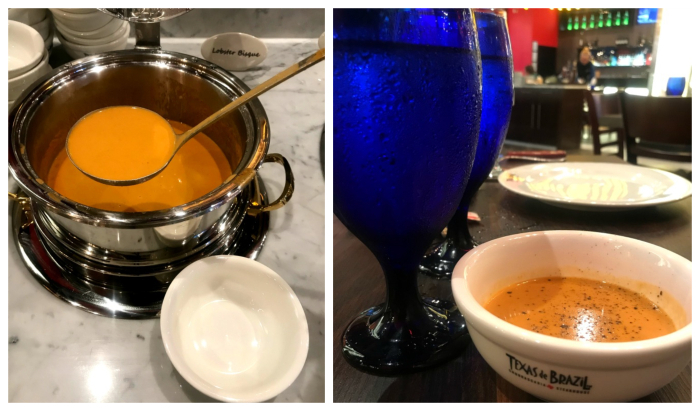 Like all of the Brazilian steakhouses I’ve dined at in the past, there is a soup and salad bar but this one, at Texas de Brazil, is way more expansive than others I’ve been to. 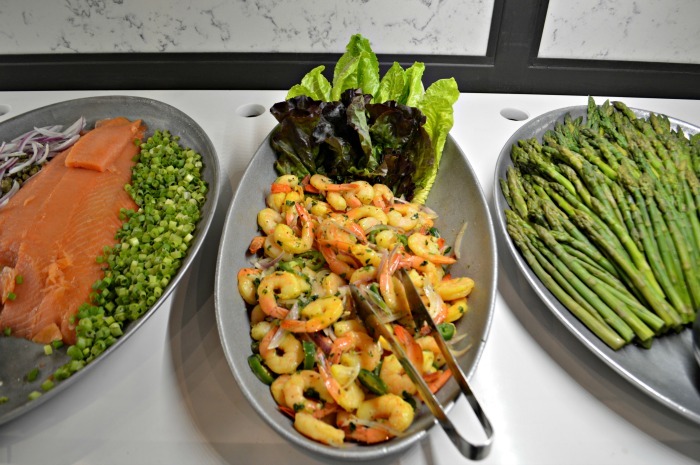 There was a plethora of options ranging from lobster bisque, gourmet artisan breads, sushi, imported cheeses, charcuterie, shrimp salad, sauteed mushrooms, feijoada, jasmine rice, fresh vegetables, and so much more. 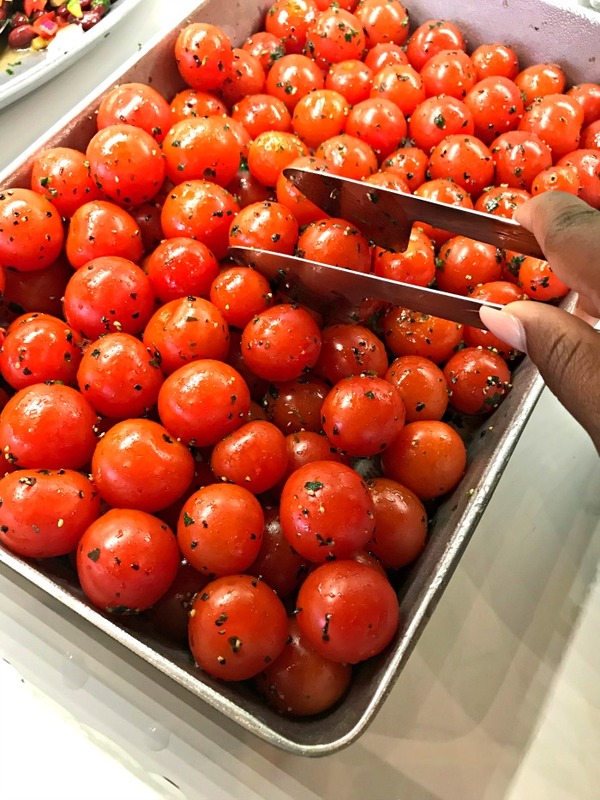 One could definitely enjoy the salad bar alone. The soup du jour this particular evening was a lobster bisque and it was quite decadent. I could’ve easily been satisfied with that alone…yeah right who am I kidding?!?! It was good, but I definitely wanted “The Meats”! I am a meat lover and I do have my carnivorous ways so I was fully prepared to consume several ounces of meat during my visit! 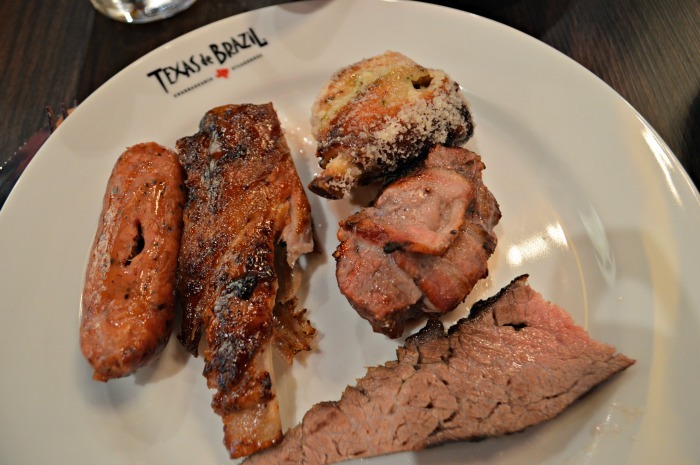 But, before I get into what I indulged in, let me tell you a little more about Texas de Brazil. 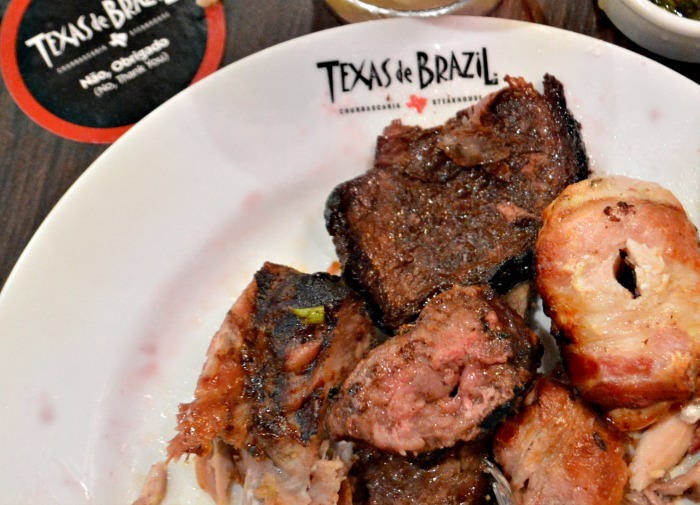 It is a family-owned, Brazilian-American Steakhouse that, as you read earlier, originated in Texas back in 1998. 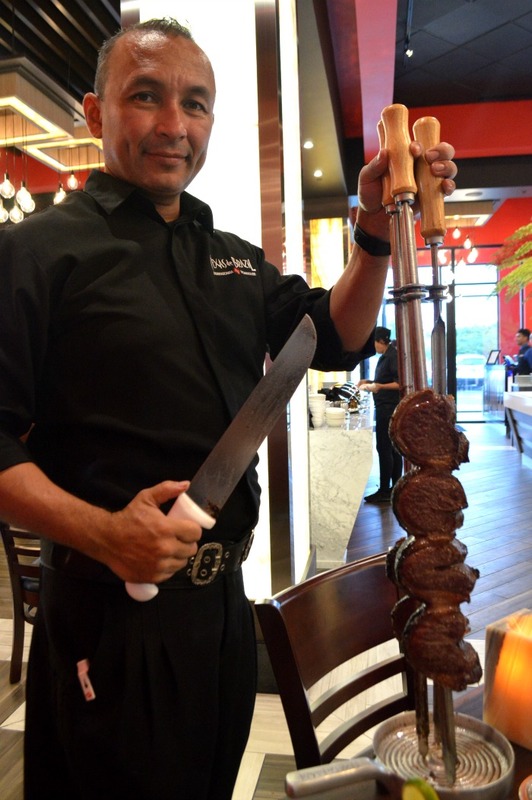 To my surprise, it is the largest Brazilian-American steakhouse in the world and the new Jacksonville location is the 10th restaurant to open in the state of Florida. Guests will be able to enjoy authentic churrasco, which is where all meats are grilled to perfection over natural wood charcoal. 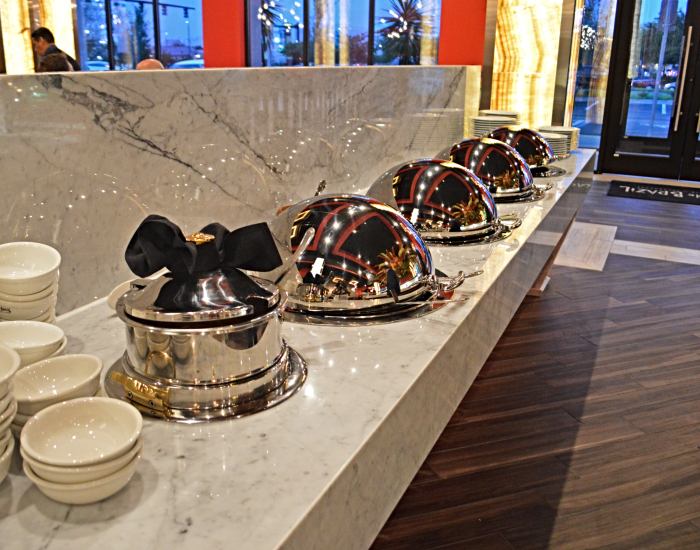 They can also look forward to the rodizio-style dining experience. The premium meat options were endless, varying from beef ribs, which were my fav, Brazilian picanha (sirloin), lamb chops, filet mignon, leg of lamb, Parmesan-crusted pork loin, bacon wrapped chicken breast, sausage and more. 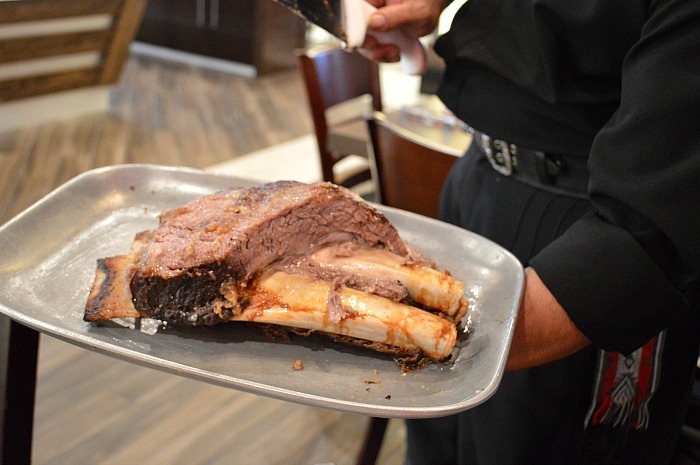 The servers come around several times throughout your meal to serve the meat, carved tableside. You signal them using the red and green discs to let them know if you need a break or if you want to keep eating. It’s all you can eat folks! Believe me, if you’re a true meat-lover, it’s hard to say no to skewers of delicious, aromatic, sizzling, and flavorful cuts of meat but you’ve definitely got to exercise some restraint to keep from getting the “meat sweats” and a belly ready to burst at the seams. 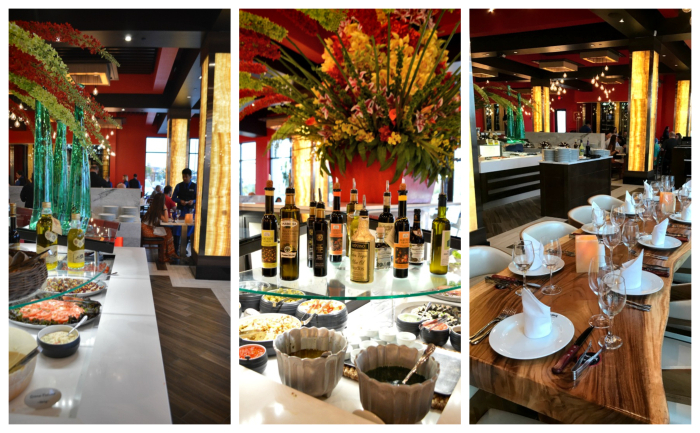 Nevertheless, the rodizio-style dining is unique and a welcomed change of pace from the average dining experience. Now there is just no way, you can enjoy all of these delicious cuts of meat with out an adult beverage to wash it all down with. 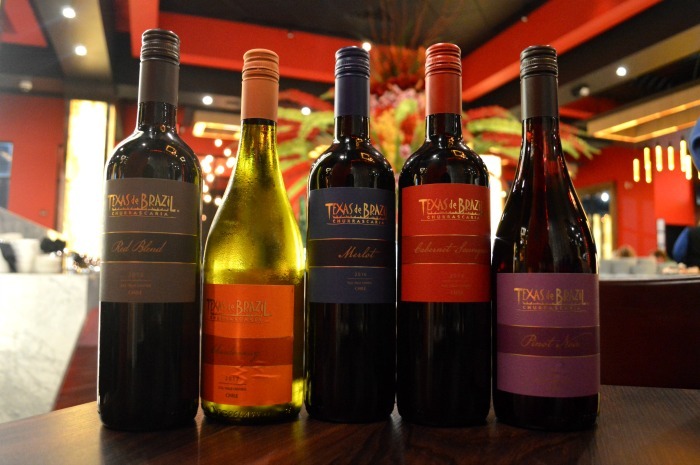 Texas de Brazil has a commendable wine collection from all around the world as well as their own varietals, bottled in Chile. However, my drink of choice for the evening was the Caipirinhas. 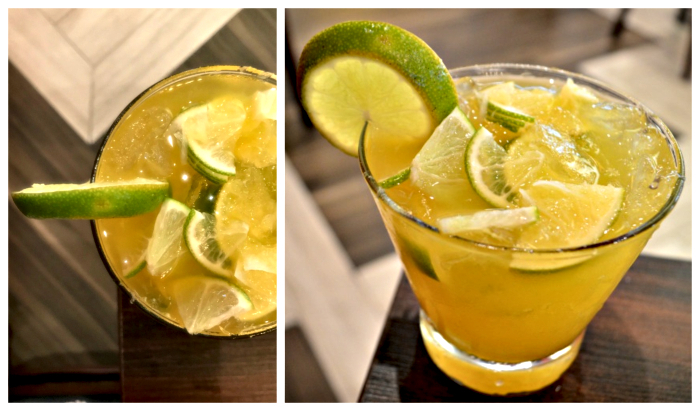 It’s one of Brazils most famous cocktails made with muddled lime, simple syrup, and cuchasa. It was absolutely divine! Speaking of amazing drinks, you can enjoy this one as well as their private label wines, and other cocktails at Happy Hour for $5, Monday-Friday from 4:30pm-6pm. School starts back in a couple weeks and my co-workers and I have already started planning Happy Hour dates! 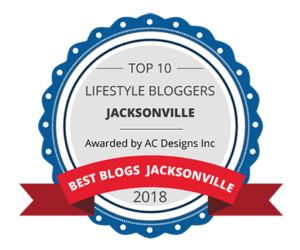 Texas de Brazil will be on the list for sure! Last, but certainly not least was dessert because no meal is complete without it. We got classic favorites, carrot cake and pecan pie but I definitely look forward to trying the Brazilian flan, cheesecake, and Key Lime pie! Next Monday, July 30th, is National Cheesecake Day and Texas de Brazil will be providing any dessert with the purchase of a meal for $0.20! 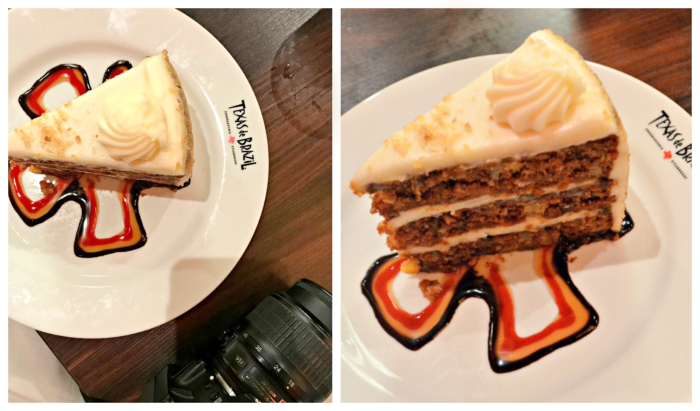 Perfect time to indulge in the Brazilian Cheesecake! Both of these desserts were amazing! By the time we got to this course, we were stuffed so we took them to go. Once we made a little room, we devoured them! 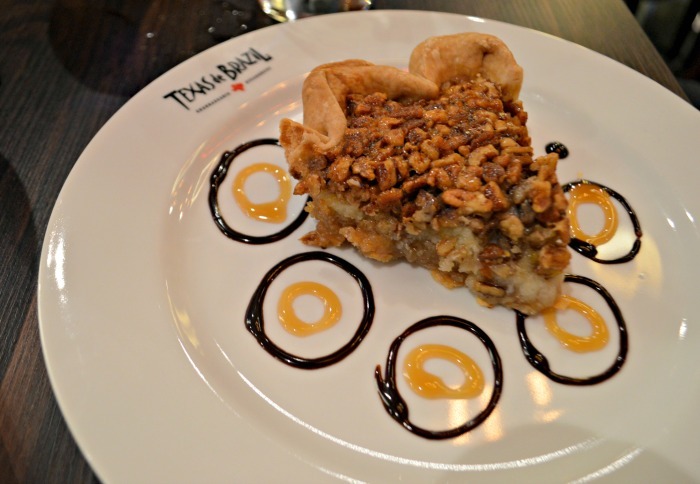 Guys, you’ve definitely got to visit the new Texas de Brazil at the St. John’s Town Center! It is a truly unique and indulgent experience. It adds a whole new meaning to “ALL YOU CAN EAT”! 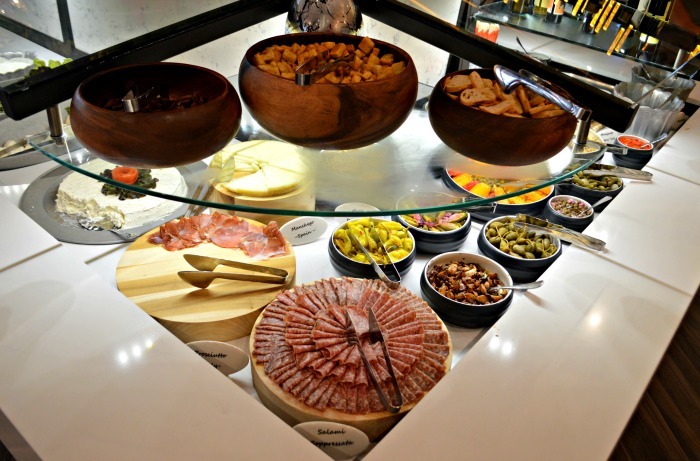 When you do decide to go, make sure it’s on an empty stomach because you’re definitely going to want to try all of the meats! As always, thanks so much for stopping by! Have a fabulous day! Previous Post This is Why The New Ford F150 is Bae! Next Post Yellow and White Striped Dress? Absolutely!